Shoulder osteoarthritis is a progressive degeneration of the shoulder joint resulting in loss of cartilage and other degenerative changes. Shoulder osteoarthritis is less common than osteoarthritis of the hips, knees, and hands. But it is a chronic debilitating problem that impacta s patient’s life in a significant way. It can make daily activities like lifting a dish from a high cupboard, wearing of clothes, making a throw or steering a car, golfing, throwing a ball lifting items overhead, putting on a seat belt, or brushing teeth and other activities difficult. The disease is gradual in onset and worsens with time. An early detection and management are associated with a better overall outcome. The shoulder joint is a complex joint between these bones. It is the most mobile joint of the body and formed by humerus, clavicle, and scapula. The glenohumeral joint is the major joint of the shoulder joint and commonly referred to as shoulder joint. Here, the head of the humerus articulates with glenoid, a shallow socket of the scapula called the glenoid. The acromioclavicular joint is between clavicle and acromion process of the scapula and is even more vulnerable to osteoarthritis. It is discussed separately. The degeneration of cartilage, the covering layer over the joints results in thinning and irregularity of the cartilage. Osteophytes are bone spurs that are also formed as a result of the repair process. These may impinge on the surrounding structures and cause pain. Prior shoulder surgery, history of trauma, inflammatory conditions (rheumatoid arthritis), and shoulder overuse are the usual causes of osteoarthritis shoulder. Individuals who engage in high-intensity overhead activities such as weightlifters and racquet sports players are at increased risk. People who require frequent lifting objects overhead, throwing, or doing high-impact activities, such as chopping wood or using an air-hammer are more likely to develop shoulder osteoarthritis. Congenital defects of the shoulder or a disease involving shoulder joint can lead to shoulder osteoarthritis. A woman whose mother has shoulder osteoarthritis is more likely to develop the disease than another woman whose mother did not have the shoulder osteoarthritis. Glenohumeral arthritis is more common in women. The symptoms, like other osteoarthritis, are gradual in onset and progression. There may be dull aching pain at night and difficulty in sleeping because of pain. Decrease in range of motion is both in active and passive motions. Sometimes, a phenomenon known as catching occurs. Catching is a sudden interruption of movement and is often associated with popping or crunching sound. Catching could indicate shoulder osteoarthritis. Loss of cartilage can lead to the friction of denuded bones making a sound termed as crepitus. Symptoms may lead to decreased use of shoulder resulting in muscle wasting. However, a decrease in activity makes the condition worse, making it stiffer. Swelling can occur in shoulder arthritis, though can be less pronounced than it is in other types of arthritis, such as knee or hand arthritis. The symptoms may worsen with time and flare up after activity. Osteoarthritis is usually diagnosed by a combination of clinical examination and history of the presenting complaint. Injecting a local anesthetic such as lidocaine can help to diagnose shoulder osteoarthritis. If the pain is temporarily relieved after the injection, then a diagnosis of shoulder arthritis is confirmed. If the pain persists, there is some other cause of shoulder pain like rotator cuff injury. 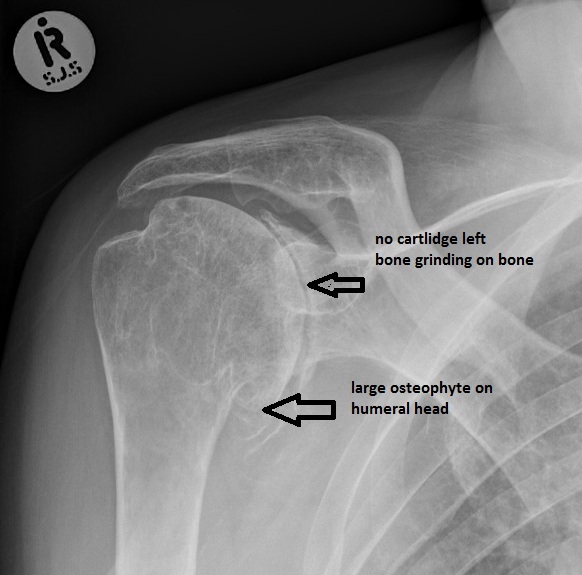 loss of joint space in the glenohumeral joint indicating loss of cartilage. MRI is helpful if the diagnosis of osteoarthritis is not clear and some other pathology needs to be ruled out. Lab tests can be used to rule out other causes of shoulder pain such as infection or gout. In suspected infection aspiration of shoulder joint could be subjected to biochemical, cytological and other staining studies. Activities that cause or worsen the shoulder pain need to be curtailed. For example chopping wood, lifting weight and other intense shoulder activities. A person with shoulder osteoarthritis should avoid working through the pain. It is advisable to take frequent rest for the required intervals. Using moist heat, such as a warming pad or whirlpool, for a few minutes can loosen a stiff shoulder joint making activity easier. Icing the shoulder joint for 15 or 20 minutes after activity can decrease swelling and provide some immediate pain relief. The relief is temporary. A physical therapy program that is focused on stretching and strengthening muscles and maintaining the shoulder’s range of motion can be helpful. Pain relievers, such as acetaminophen, NSAIDs like aspirin, ibuprofen etc to reduce the inflammation. Topical gel and pain relieving patches can be used in combination with oral pain medications. The surgeon removes unwanted material and smoothes off the joint, hopefully providing relief of symptoms. It y provides relief for a limited period. Shoulder arthroplasty is indicated in non-resolvable pain or previous failed treatments. Patient age, activity level, and the amount of bone affected determines the choice of surgery.